It is always a good idea to backup your website on a location other than your server, and Amazon S3 is a useful storage option safely hosted by the powerful Amazon servers. The last tutorial explained how to backup websites on your hosting server, and this tutorial guides you how to back up another copy of your server on Amazon S3. 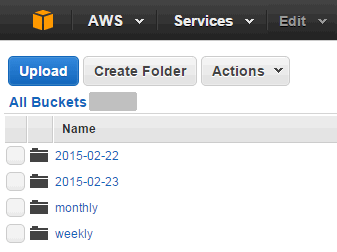 Here is how we back up our Websites on the Amazon S3 alternate backup storage destination. First you need to create an Amazon S3 account with Amazon Web Services, which will allow you to create ‘buckets’ which can reliably store content. Amazon S3 is a highly rated service for super reliable storage across different data centres, and offers very cheap storage rates which will attract many site owners. The cost of storage is $0.0300 per GB for the first terabyte of data, and since our backup is around 6 GB, it costs us just a few cents a month! I already had an Amazon web services (AWS) account as were hosting theme images/CSS on Amazon S3 and using the Amazon CloudFront service to work as a content delivery network for faster resource delivery and a faster site. So this was just another quick step to configure this setup. Remember you will also need to create security options in Amazon S3 and get the Access key ID and the Secret access key which will allow your server to communicate with Amazon S3 bucket and store your backups easily. Initially I thought that Amazon S3 will continue to store all older backups as well, and backups will continue to occupy more space, but it actually syncs to create the same backup folders as on the server. Once you have filled in all the requisite values, then save and validate the destination, and your Amazon S3 backups will start on the next Server backup schedule. 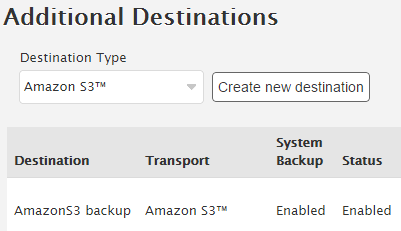 So do remember to backup your server on Amazon S3 … Takes only a few minutes, but can save your website one fine day.